The shrimp and fish combo at Garrison’s Seafood Express. 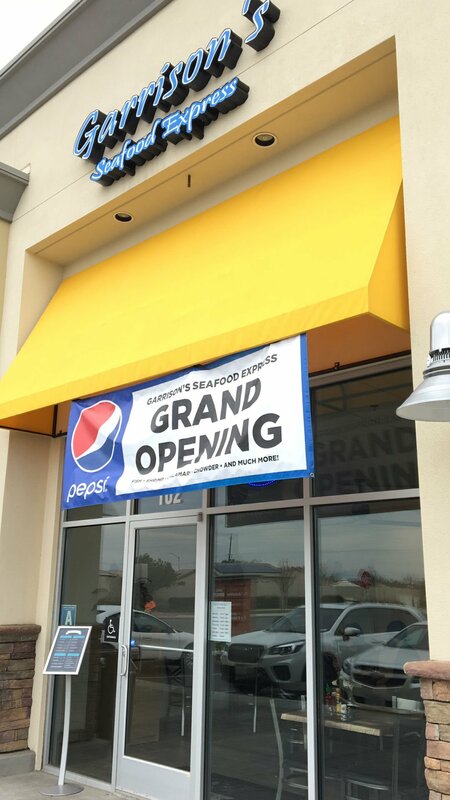 Garrison’s Seafood Express is located next to the Pieology off Panama Lane in southwest Bakersfield. Nautical touches jazz up the decor at Garrison’s Seafood Express. The cod combo, foreground, and "guppy a la carte" tilapia at Garrison's Seafood Express. The cod combo at Garrison's Seafood Express. Along with combos, you can order “guppy a la carte” like this tilapia at Garrison’s Seafood Express. The clam strips at Garrison's Seafood Express. Nautical decor enlivens the atmosphere at Garrison's Seafood Express. Raising Cane's Chicken Fingers is expected to open soon on Downing Avenue. It's been a few years since Sea Breeze Fish and Chips closed in southwest Bakersfield. That restaurant, along with a sister location downtown and Olde Port Fish Grotto before that, helped meet Bakersfield diners' desire for seafood. Those establishments are closed, but demand grows as consumers look to further expand their diets beyond meat and potatoes. Luckily, we have a fisherman's net full of boiled Cajun seafood spots — Crab in a Bag, Rockin' Crawfish, Claw Daddy’s, Captain Crawfish — as well as restaurants offering fine seafood specials. Now we've also got a pair of new eateries that are seafood-forward. Garrison's Seafood Express is in the WinCo shopping center at Panama Lane and Ashe Road, also home to Angel Donuts, Love Sushi, Pieology and Big D’s Smokehouse & Grill. It was opened in December by James Ray, a Kern County Sheriff’s detentions deputy and real estate broker. The menu plumbs the depths of the deep-fried sea in the best way possible. Diners can choose from fish and chips combos featuring tilapia ($12), catfish ($13) or cod ($13), which also include hushpuppies and coleslaw. Fried shrimp is also featured in combos (eight pieces or four pieces and one piece of fish) for $14. Also had a chance to sample the shrimp, which were plump and crispy with that seasoned batter, and the clam strips ($10), served with cocktail sauce. Other than one extra chewy strip, the side dish was a nice option for sharing and it's not surprising that customers requested it be added to the menu. The restaurant is small and inviting with nice nautical touches of netting and wooden fish. It seems like this place could get packed, but they lived up to the "express" in their name, delivering combos in under 10 minutes. Garrison's Seafood Express is at 6509 Panama Lane, Suite 102. Hours are 11 a.m. to 8 p.m. Monday through Saturday. Check out the menu and more at facebook.com/GarrisonsSeafoodExpress. 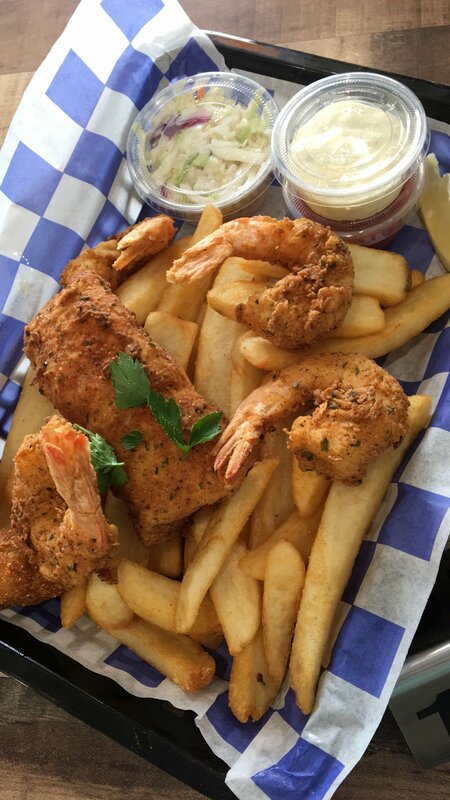 Another new seafood spot is Papa Hill's Fish Grill, which opened on South Chester Avenue in November. Searching the internet yielded news of another Papa Hill's at the Northridge Fashion Center, but that appears to have recently closed. Speaking of sides, Papa Hill's has quite the assortment including green salad, vegetables, white and brown rice, onion rings and dumplings. Papa Hill's Fish Grill is at 2850 S. Chester Ave., Suite D. Hours are 11 a.m. to 9 p.m. Monday through Saturday, 11 a.m to 7 p.m. Sunday. For the menu and more information, call 564-9083 or visit facebook.com/wwwpapahillsfishcom. There's more on the horizon than seafood in Bakersfield. Here's a look at some restaurants coming this year. • Angry Barnyard BBQ, which operates the Barnyard at Match Point Grill at the Bakersfield Racquet Club, will open a second location nearby. It announced via Facebook that there will be a new restaurant going up at 916 18th St. in the growing Eastchester district. They shared their excitement to be part of the area's growth noting "... we absolutely love what’s going on downtown! So many cool stores and restaurants popping up down here!" An opening date is expected soon. • Yoshinoya Japanese Kitchen will return to Bakersfield with a new location going up at White Lane and South H Street. • Victor's Mexican Grill is working on a third restaurant, taking over the former Mesa Mexican Grill location at 509 Mount Vernon Ave.
• Wingstop will open another location by the Vons on Stockdale Highway, next to a Mountain Mike's Pizza. • It seems like any day now that Raising Cane's Chicken Fingers will open at 7901 Downing Ave. The website was updated to list a birthday of Feb. 12, 2019, so it's likely you can treat your valentine to a fried chicken finger feast.